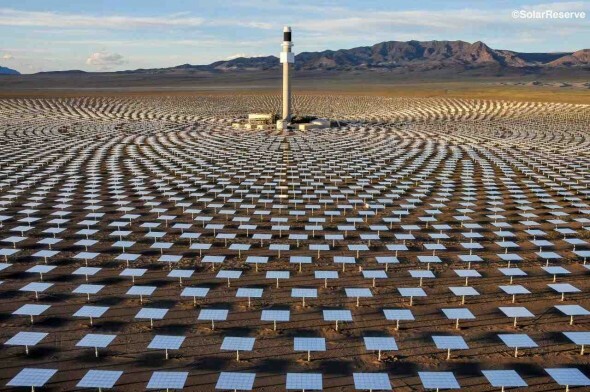 There is a great deal of false information circulating about the South Australian solar-thermal plant that is been approved for construction. The cost is $650 million and for this you could build a combined cycle gas plant dispatching around 500MW. Now let’s look at what South Australians are getting for their money. The technical data I use comes from the following reneweconomy article. What happens in a thermal-solar plant is that the sun’s heat is used to heat up molten salt which is stored in a large insulated tank. It the SA case, the tank has the capacity” to store heat that will later generate 1100MWh of electricity. The molten salt is then passed through heat exchangers to turn water into steam and this steam then drives an electric generator. But what size generator to use? Remember there is only 1100MWh of stored electric energy available. So we could have an 1100MW turbine and it could run at max for 1 hour before the stored energy is expended or we could have a 45MW generator which would in theory give us 24/7 despatchable power. In reality, cloudy days would make this impossible. So the 1100MW turbine would have a capacity factor of 4.1% (1 / 24) and the 45MW turbine would have a capacity factor of 100%, but both process the same amount of energy. For this reason, capacity factor for a solar-thermal is totally meaningless despite what the reneweconomy article says. The project is actually installing a 150MW generator but about 10% of that is lost in conversion and plant operating requirements so only 135MW is delivered to the grid. However, the steam needs to drive the 150MW generator and 1100/150 = 7.3 hours. Renewenergy says about 8 hours. So we get 8 hours of generation at 135MW per day. Hardly despatchable! A 500MW combined cycle gas plant that can deliver the 500MW for probably 95% of the time(12,000MWh/day). It receives no ARENA subsidies or LREC’s for each MWh produced. A 150MW solar-thermal plant that can deliver 135MW for 8 hours a day(1100MWh/day) on average. It receives a $110 million dollar concessional loan from ARENA and LREC’s (currently about $80/MWh) for each MWh produced. So somehow, option “2” above was better than option “1” above. The SA government has signed a contract to buy 20 years output from the facility at around $78 which is around $39 million a year. But what about the LREC’s? Pardon my ignorance but why is the SA government not picking up 100% of the LREC’s? They are only taking 25% so someone else has to fork out the other 75% which will be SA businesses and householders. What a slimebag act. 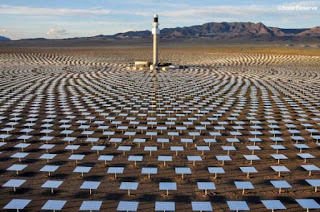 At $80/MWh, the full annual cost of the solar-thermal generated electricity LREC’s is $40 million and the SA government are paying only $10 million of it and duckshoving the rest onto SA businesses and households. I despair for this country. The AEMO daily price for 18Jan18 for South Australia was $1,074 per MWhr which was the highest since $1,492.16 on 8Feb17 no surprise there. But Victoria yesterday recorded a stunning $905.22 which is 4.6 times the previous highest of $195.67 on 10Feb17. You can toggle between SA & Vic at this AEMO page and also choose between 30min and 5min price views. Then the NEM Dispatch Overview.